Remember the LG Rolly Keyboard? A wireless portable keyboard that could be folded into an easy-to-carry stick. Well, a successor to that device has been unveiled. Appropriately dubbed Rolly Keyboard 2, the new keyboard contains several improvements over its predecessor. While the first-gen Rolly had four rows of keys, the successor rolls up along five. 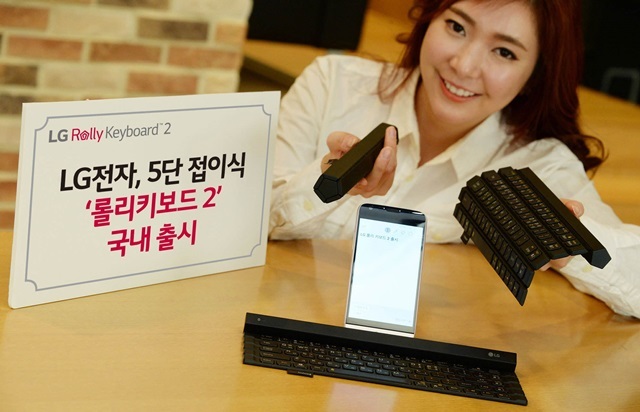 LG has also added a tab at the bottom that the company claims makes it easier for users to open the keyboard. While using the same Bluetooth tech, the Rolly 2 is capable of pairing up to 3 three devices, compared to 2 devices on the original one. The Rolly Keyboard 2 carries a price tag of around $110, and will be available for purchase in LG's home country of South Korea. There's currently no information on if and when it will be available in international markets. Microsoft BT foldable keyboard fits well in your pocket. Thin, and flat. $100.